If you’re traveling to Airventure 2016 in Oshkosh, Wisconsin (by air or by land), you may want to stop at the Iowa Aviation Museum along the way. The museum is owned and operated by Greg Schildberg, a third generation pilot, whose grandfather established a landing strip just north of Greenfield, Iowa. The field was taken over by the second generation of Schildbergs in the 1940s, when Greg’s father enlisted for service in the Army Air Corps. Over the years, some 16 aircraft- mostly single or double seat biplanes- were added to the collection, all of which are on display in the small hangar at the end of the Greenfield Airport’s two concrete runways. The museum is currently featuring a traveling exhibition detailing the history of balloons and airships in the United States. 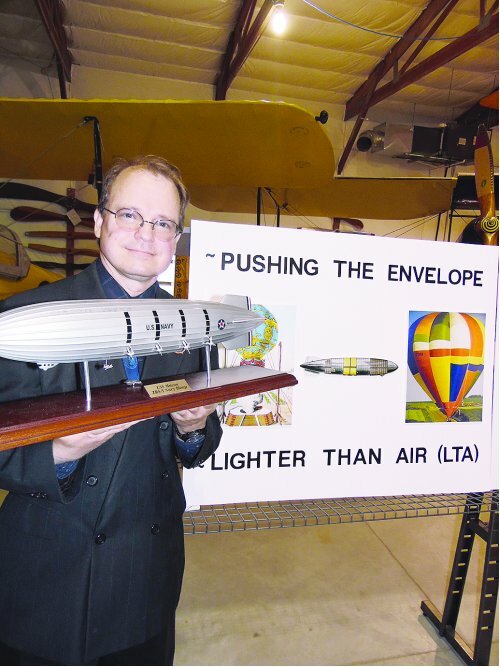 Titled “Pushing the Envelope: Lighter than Air in America,” the exhibit contains nearly 200 vintage photographs, prints, and engineer’s drawings of early 19th century balloons and the great zeppelin dirigibles of the early 20th century. Included in the comprehensive assemblage are also artifacts of the era such as large scale models of the U.S.S. Akron and U.S.S. Macon, the largest flying machines ever built in the United States. The exhibit also focuses on Iowa native, Jerome Hunsaker, who, as Chief of Naval Aeronautics Construction, presided over the commissioning of the U.S.S. Shenandoah, the first zeppelin dirigible built in the U.S, and later, the U.S.S. Akron and Macon. Images of the airships reveal their complex framework and the intricate weaving of metal and gasbags that allowed the nearly 800 foot long giants to gently glide through the skies. Sadly, the U.S.S. Shenandoah would maintain a career of only two years, having been christened in 1924 and crashing, tragically, over southeast Ohio, in 1926. The 2,115,000 cubic foot leviathan was thrust to an altitude of more than 9,000 feet by a powerful storm, then descended rapidly, struck the ground, and broke into three sections. Fourteen crew died in the incident. Strips of skin from the dirigible were scattered across the countryside and picked up by area residents. One such swatch, form the airship’s aft section, is on display in the exhibit. The Akron and Macon met with similar fates, both crashed at sea with great loss of life. In 1933, the Akron encountered a storm over the North Atlantic, and plunged into the sea tail first, dragging the rest of the airship into the water, taking 73 of the crew down with her. Two years later, in 1935, after proving its ability to carry, launch, and recover fighter planes as an airborne aircraft carrier, the Macon was hit be strong straight line winds over the Pacific Ocean near San Fransisco, and disappeared beneath the waves. This time, equipped with life vests, 81 of the 83 crew on board survived. Germany, however, continued to create airships, including the LZ-129, known as the Hindenburg. Unlike their U.S. counterparts, the zeppelin’s built by the Third Reich were filled with flammable hydrogen compared to the American fleet which used helium, an inert gas that does not ignite. The Hindenburg, at 803 feet in length, was even longer than the Akron and Macon and was built to transport passengers across the Atlantic, not as a military vessel. It has never been fully determined as to what caused the ignition of the airship’s 7 million cubic feet of hydrogen and air, but sabotage has been suspected. The more commonly accepted explanation, however, is that once the tow lines were thrown from the zeppelin to the tarmac, the dirigible became grounded, and with a lightning storm having just passed, the electrically charged air ignited the hydrogen gas. Whatever the cause of the calamity, there has not been airship passenger traffic across the seas since. The exhibit at the Iowa Aviation Museum contains memorabilia from the Hindenburg, including posted flight schedules, baggage tags, and airmail flown aboard the ill fated legend. It is a somber reminder of the hopes and dreams of an era and a luxurious form of travel long since lost to the day of the airship.